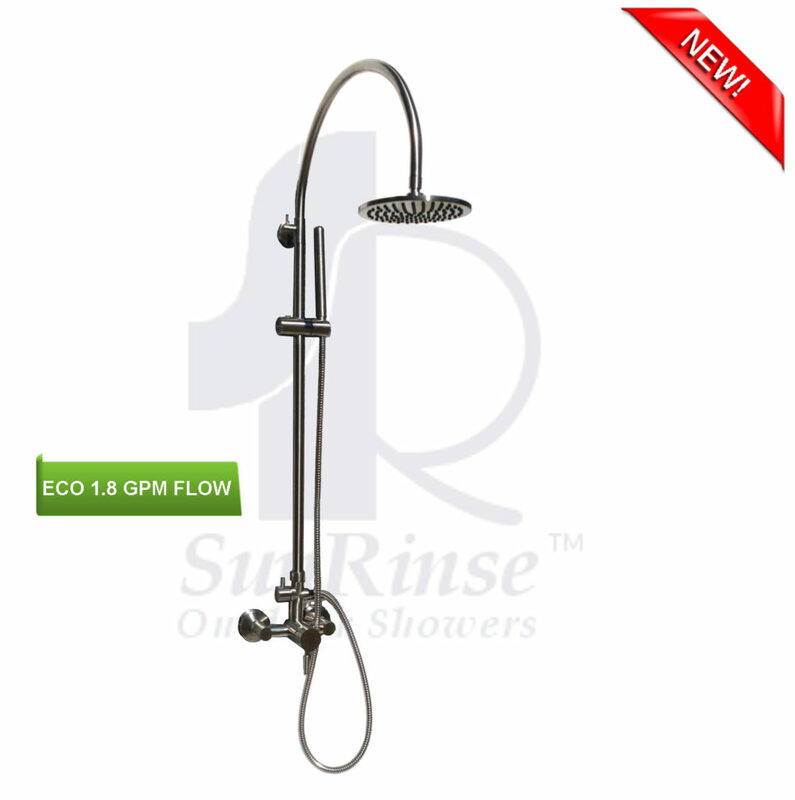 Take a shower anytime of the year, morning, day, evening or night, direct sunlight or not. 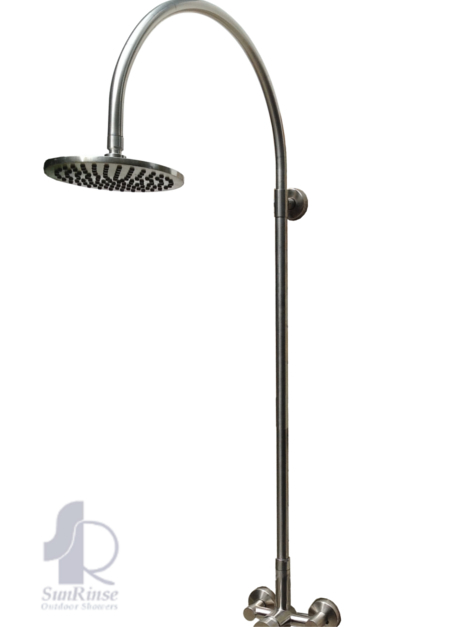 Enjoy instant and continuous hot water for your shower as soon as the shower is turned on. 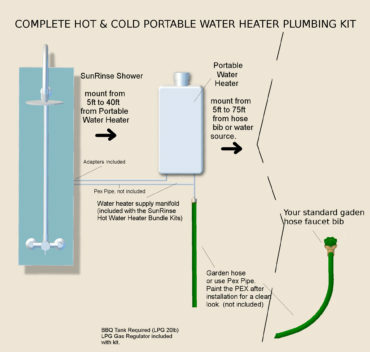 Efficiently using clean burning propane and tankless hot water technology wrapped up in a portable unit will deliver approximately 6 hours of continuous hot water or 40-50, 8-minute hot water showers per 20lb propane tank. 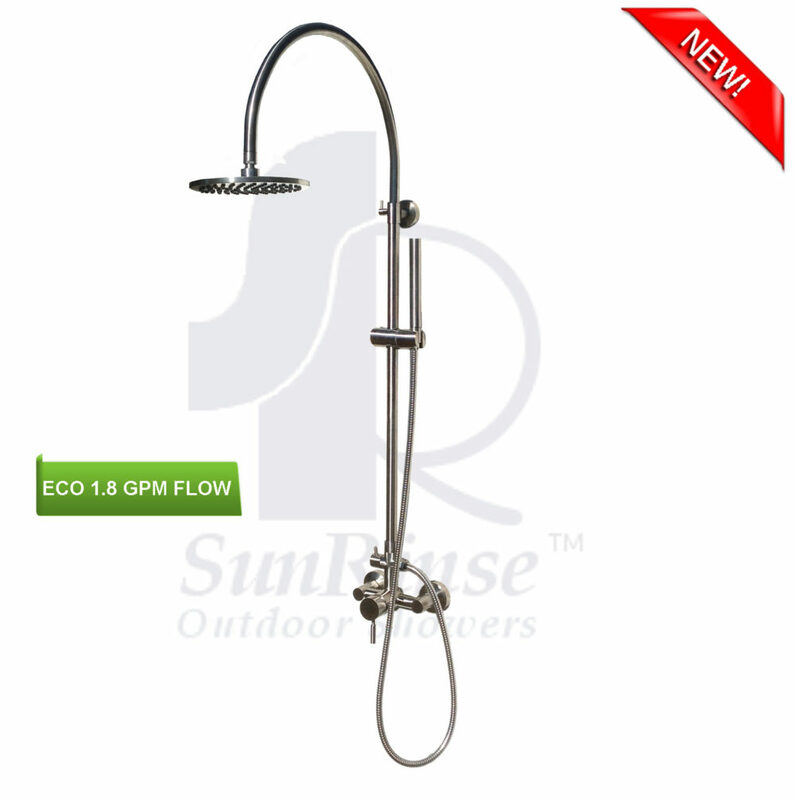 As an option, you can now enjoy luxurious hot water outdoor showers without expensive plumbing. 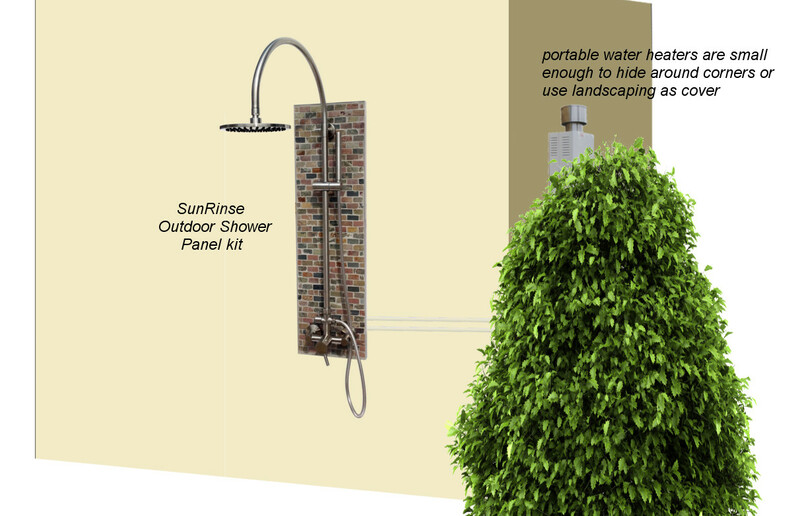 SunRinse has matched up an instant, tank-less and portable hot water heater that feeds your outdoor shower with constant hot water without the necessary plumbing required to pipe hot water from the inside of your house. 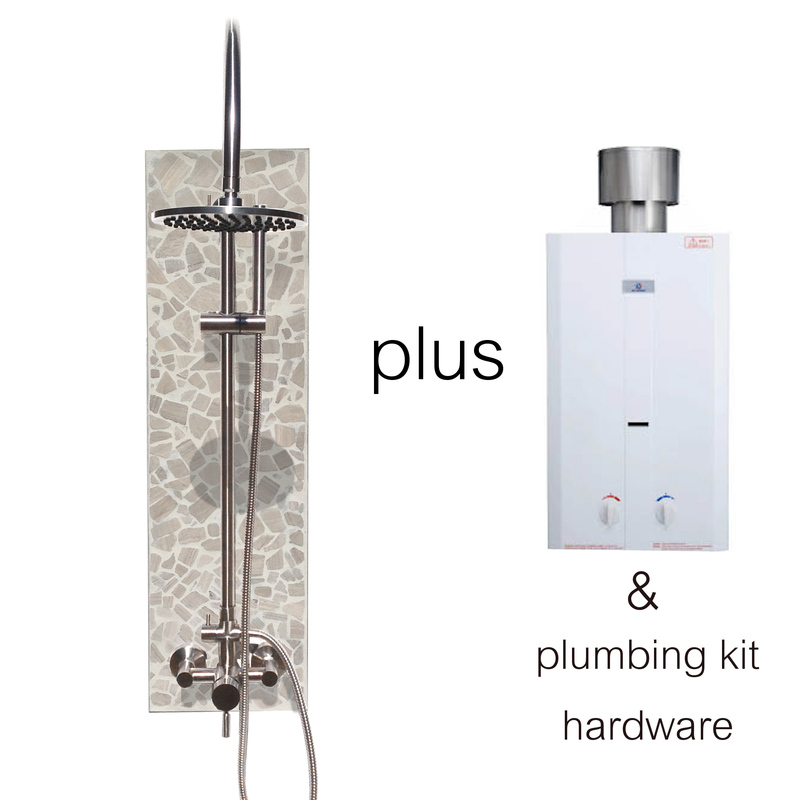 The EccoTemp tank-less water heater was chosen for it’s ability to deliver a continuous flow of hot water, it’s portability and low cost. It only requires using a standard propane BBQ tank and (2) D-Cell flashlight batteries. 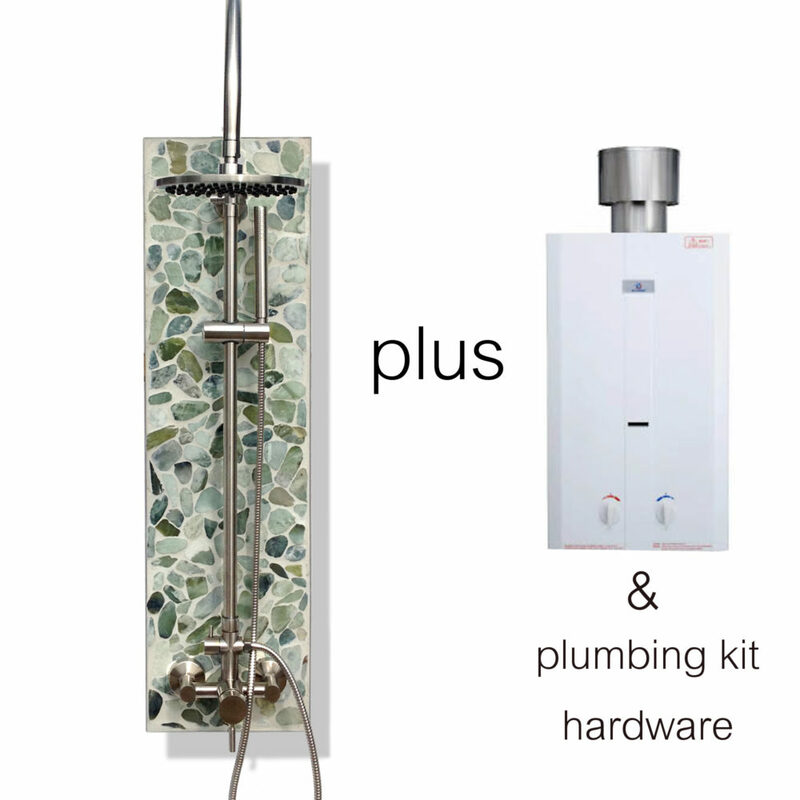 SunRinse provides the manifold kit for the portable hot water heater free with any Hot Water Panel kits. The manifold eliminates two water lines for the hot and cold to the heater. Only one water source is needed, such as a garden hose. Installation is as easy as connecting to a water hose to the EccoTemp water heater and completing the installation with easy to use PEX tubing. 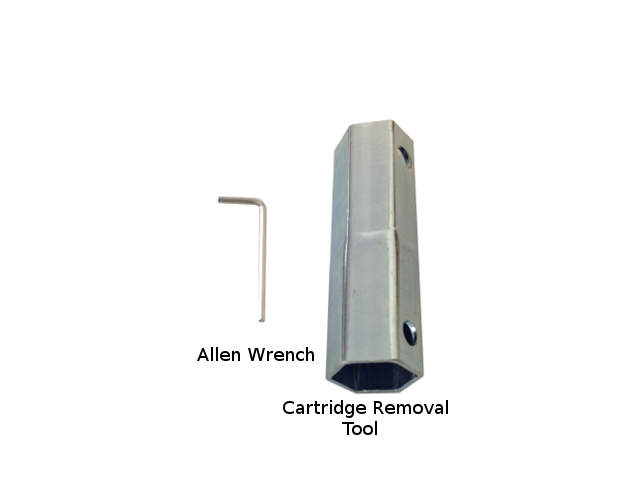 PEX tubing is very easy to cut with a utility knife, the connectors and tubing are secured with standard hose clamps, and PEX fittings are completely compatible with NPT threaded plumbing fittings. Paint the PEX the color of the house siding to create a cleaner, professional look. Or, you many bury the PEX and feed outdoor showers from the bottom. Using the portable heater in conjunction with SunRinse Panel kits enables almost endless placement locations. No electrical, direct sunlight, no hard gas fuel piping needed. Place anywhere withing as far as you can reach with a garden hose or PEX tubing. 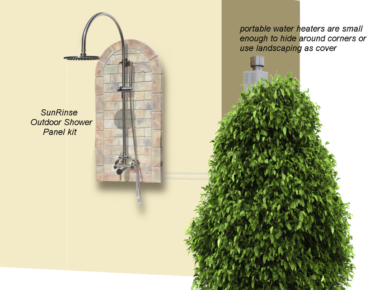 Pool sides, boat docks, beach sides, in the shade of landscape, the trail from the lake, virtually anywhere you can imagine a beautiful hot water outdoor shower can be placed. 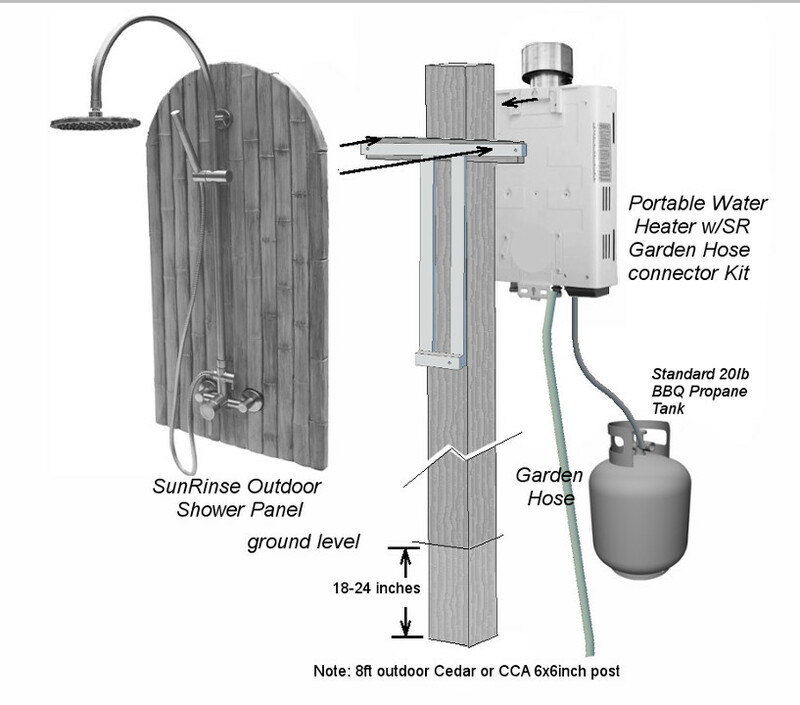 Hide the portable hot water heater around a corner, behind the shrubs, outside of the outdoor shower enclosure. 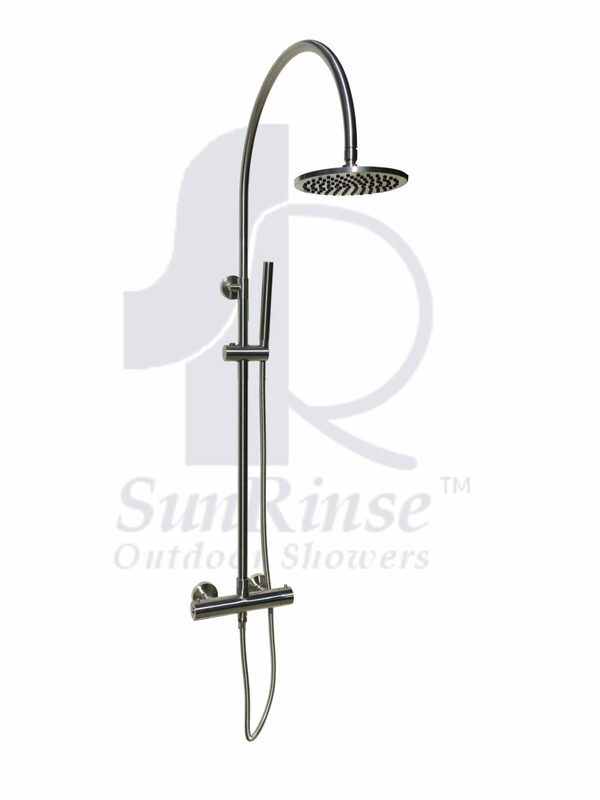 SunRinse recommends the hot water heater placed within 20 ft of the outdoor shower for an instantaneous hot shower as soon as the shower is turned on. The (2) flashlight batteries ignite the water heater instantly with pressure change of turning the water on at the shower. The BBQ propane tank will last approximately 50 hot showers at 5 minutes apiece. 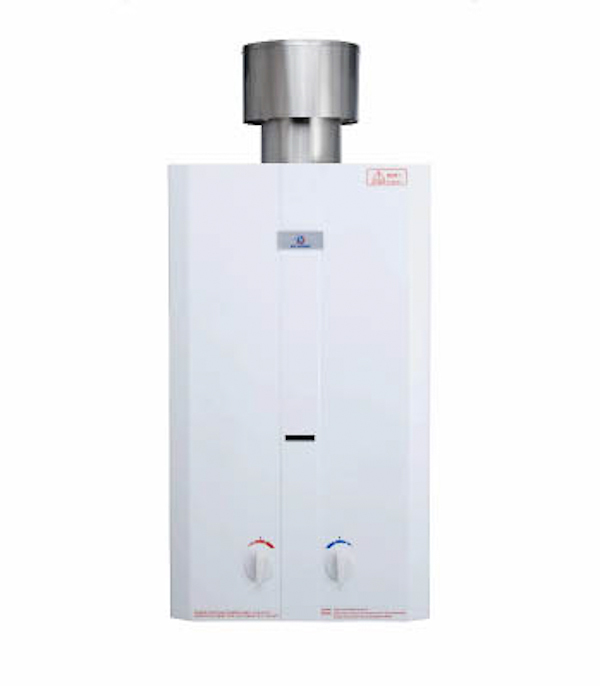 The Eccotemp L10 Tankless Water Heater is one of the hottest tankless water heaters on the market! 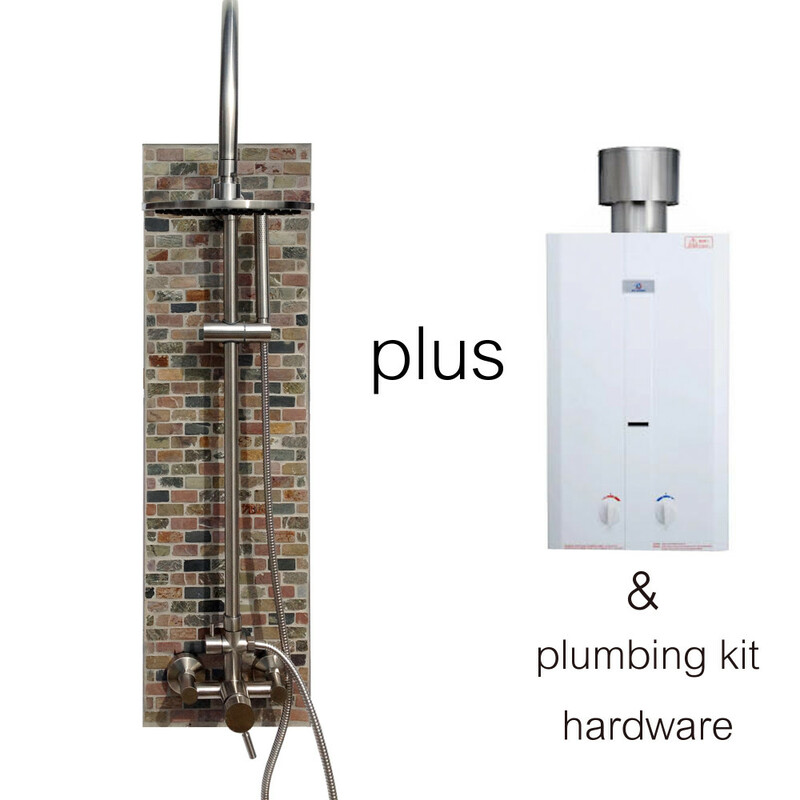 The Eccotemp L10 Tankless Water Heater gives you endless hot water at your outdoor shower, cabin, summer cottage, lake home, potting shed, RV, camper, horse washing stall or wherever else you need hot water. 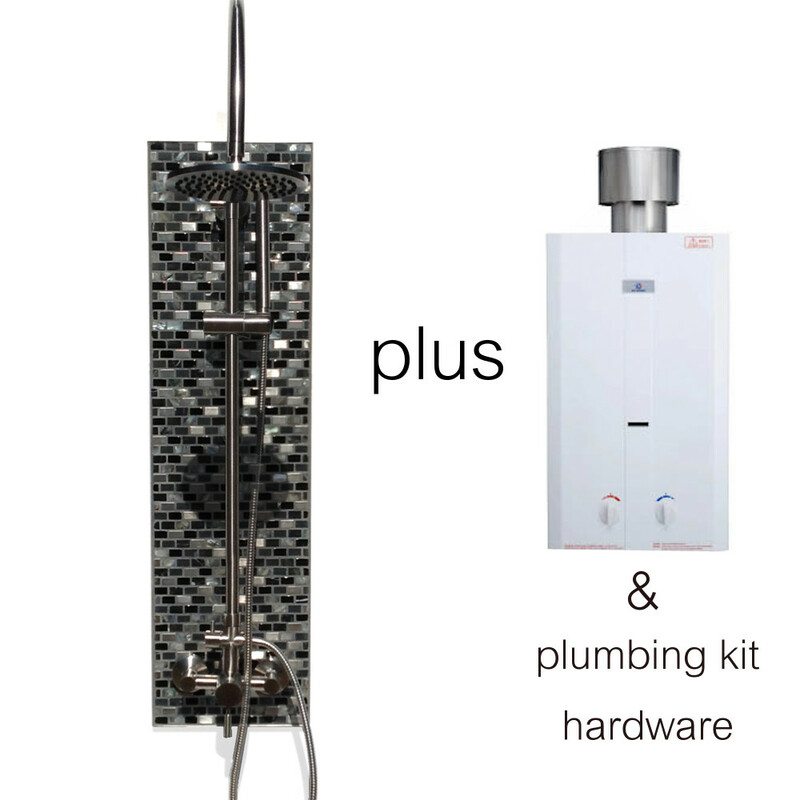 The Eccotemp L10 Tankless Water Heater delivers up to 2.6 Gallons Per Minute of hot water ranging from 80-145 degrees F. The 2 “D” cell battery ignition starts the flame only when water is running, so there’s no chance of overheating. 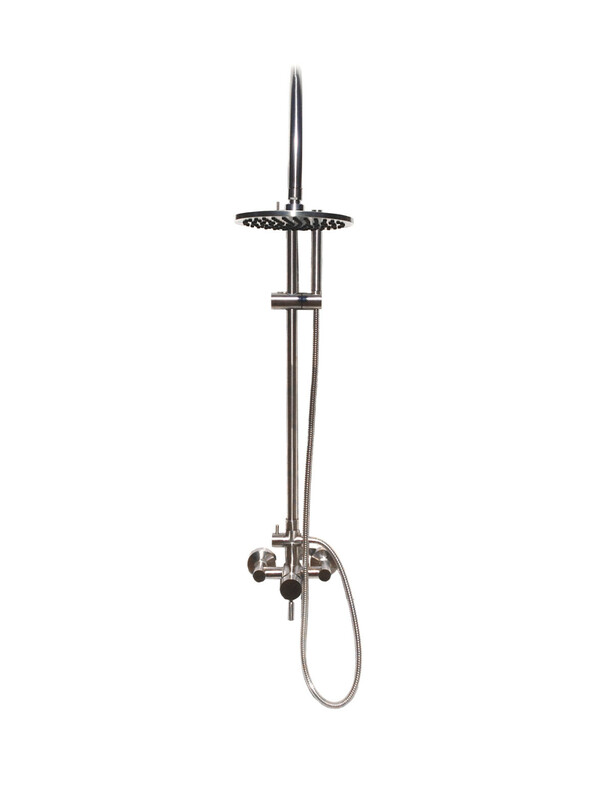 The L10 comes with standard 1/2″ NPT fittings, making it easily plumbed in with standard fixtures. 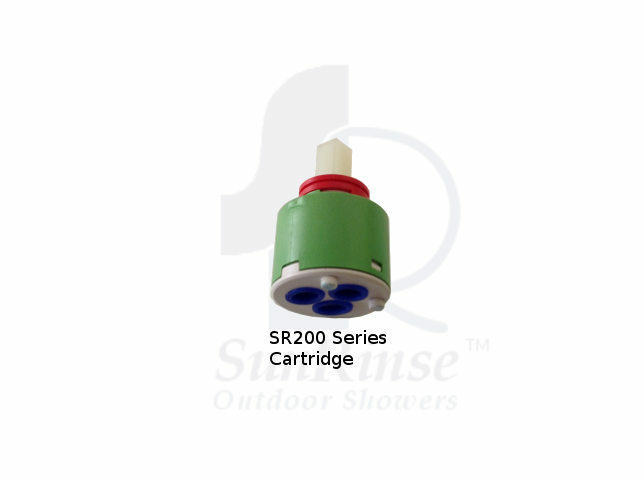 The ideal operating range is 20-80 PSI. Contemporary mix with outdoor aesthetics are combine make up this jewel. 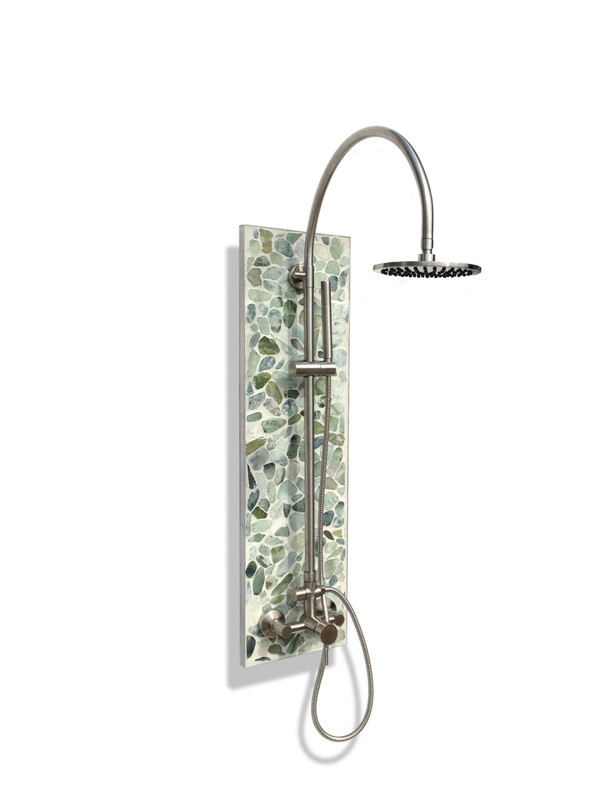 Natural green sea glass set in white grout make this a shower for any coastline build. 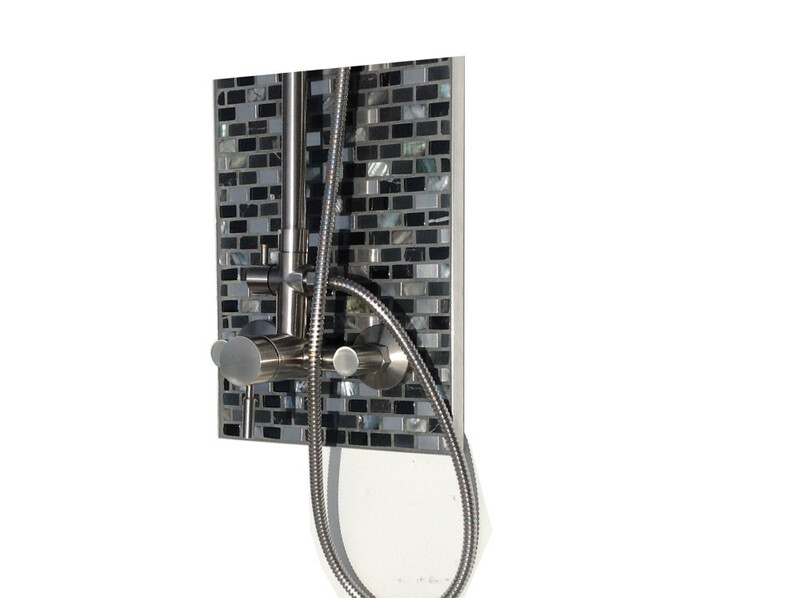 A perfect fit for your beach house stand alone shower, or adds color to any outdoor shower enclosure. Contemporary mix with outdoor aesthetics combine make up this jewel. 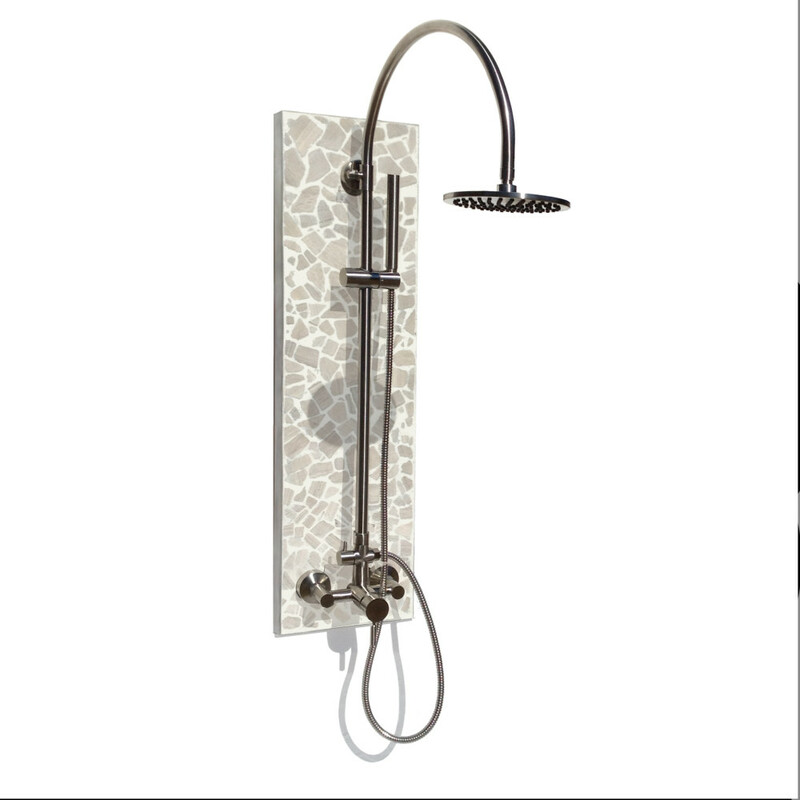 Natural glass with green tones set in white grout make this a shower for any coastline build. Use in natural landscape enclosures to create a real outdoor experience. 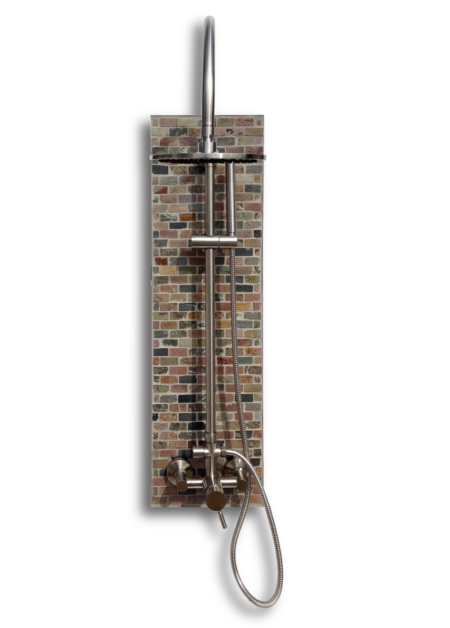 Stylish contemporary outdoor shower made with black recycled glass tiles with turquoise, gray, pearl and reflective steel accents. 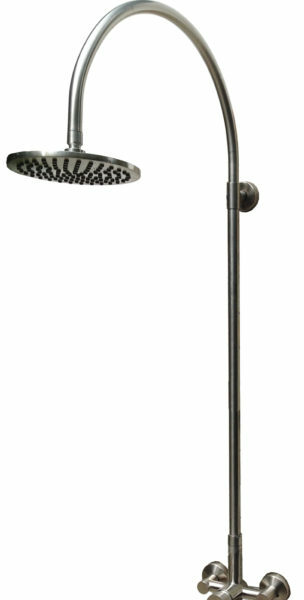 Fashionable style with a subtle outdoor look, compliments the latest in outdoor shower designs. 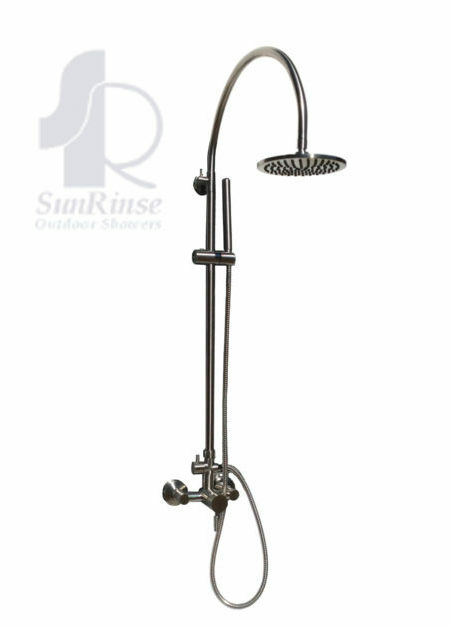 The stylish steel accents is a perfect match to the attached SunRinse stainless steel faucet. 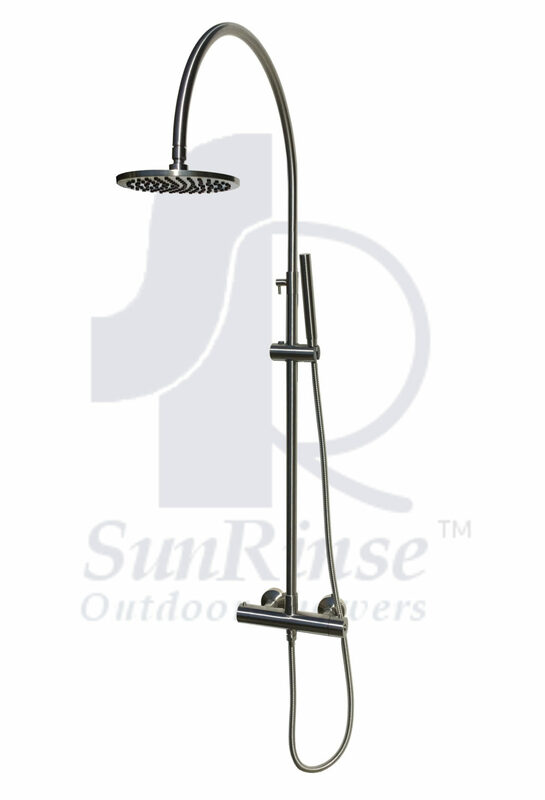 SunRinse outdoor shower fixture is made with Marine grade 316 Stainless Steel!